Update 2/3/17: Today I noticed a welcomed change to how Inbox by Gmail is handling calendar invites from Exchange accounts. 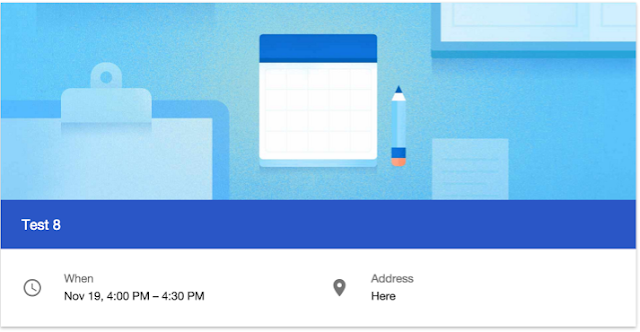 Previously, as described below, the invite was parsed into a lovely card, like Google Calendar invites, however you were not able to accept the invite from within Inbox, as shown in the image below with the event Test 8. Now, you can accept, decline, or say maybe right from within Inbox and the event is already on your Google Calendar. First image below is showing you can respond without even opening the email. The second image shows the fully opened email/card where you can also reply to the invite. I know this is a welcome addition for many of you as this was a major source of complaints and feedback. What you all may notice missing is there is still no ability to act on the invite from within Inbox. In other words, invitees will not be able to RSVP from the email invitation. Rest assured, the event will still appear in your calendar and you will have the ability to RSVP from there. I know this isnt the whole package people have been looking for, but the team has heard your feedback about interactivity / RSVP from within Inbox and is aware. Please also continue to send feedback within the app. I have and like the smartcard feature. However, as of today (December 9, 2015), the .ics calendar attachment/invite does not create an item on my Google Calendar. It also does not show some of the relevant information: meeting call-in numbers are often included in the 'Description' field, so I can't access the call information from Inbox. I have been downloading and opening the attachment in iCal, in order to have the full invitation show up on my Gmail calendar. A fix for this-- to open the invitation in Inbox-- would be much appreciated. It is so non-intuitive and braindead, I wonder if any of you have used this feature. There is some genius in Inbox, but this is a serious showstopper. no news about it? This is the one feature stopping me from completely migrating to inbox. I have to go to gmail.com to accept an invitation. Totally agree, it's very unproductive like this. Either having to switch back to gmail or calendar is just annoying and kind of defeats the purpose of the cards. Will this be fixed at all? Why we are going backward. it is much easier to deal with the event request right in the email and no need to switch to the calendar to just update your your status. I don't understand why this works in GMail, but not in Inbox. This has gotten worse recently. Makes no sense. On iOS, with inbox and the gmail app, there appears to be no way to add an event to the calendar (with supporting detail) as well as a confirmation status. I feel like we are back in 1993 when everyone needed to carry a calendar portfolio notebook. How can this not be a priority!!! This worked in the old gmail app on iOS, but that was recently updated/broken.